Dubai Food Festival is one of the most awaited events in the United Arab Emirates. It brings alive the city as a happening destination for foodies. With gastronomic events held across the cityscape, Dubai thrives as an ultimate dining hub for 15 days from February 25 to March 12 every year. However, the schedule of Dubai Food Festival 2016 includes some first-even events which have already triggered lots of curiosity and excitement. Take a walk through the special events of Dubai Food Festival 2016 so that you can understand why it should not be missed this year. Dubai Food Festival 2016 is all set to be a departure from the previous years. It will see the first ever long table lunch for 1000 guests at a time, on February 26 this year. 1000 guests will be treated to a specially designed three-course meal at the long table lunch, a culinary revelry among the events in the schedule of Dubai Food Festival 2016. Popular in Germany, the long table lunch is a communal event with a street party atmosphere for a large gathering in downtown Dubai. It provides room for great conversation, communal harmony and gastronomic revelry. It will celebrate the most popular Dubai food. The Dubai Long Table Lunch menu is designed by award-winning chefs from the Palace Downtown Dubai, the Address Dubai Marina, the Address Dubai Mall, Manzil Downtown Dubai and Vida Downtown Dubai. It promises to be a family-friendly dining experience at the Dubai Food Festival this year. Besides the long table lunch, the Dubai Restaurant Week is the first-ever event to be held during the Dubai Food Festival 2016. 30 of the best restaurants in Dubai are participating to offer their unique merchandise during the Dubai Restaurant Week from February 25 till March 5. The Ivy, The Croft, Rang Mahal, Kiku, Junoon, Okku, Sea Fu, and Yuan and Zheng are some of the participating Dubai restaurants. What is the most exciting about Dubai Food Festival 2016 is the celebration of “Hidden Gems,” which are lesser-known eating joints serving great food across the culinary landscape of Dubai City. 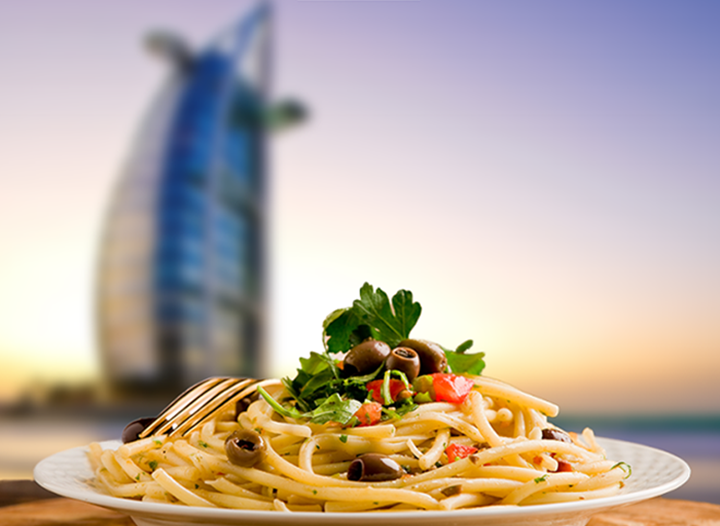 Since Dubai houses over 200 nationalities, there are many restaurants serving good food from different cuisines, but they are not widely known. That’s why residents and foodies are invited to discover these hidden gems which the festival authority will shortlist the best 20 from. It is a cherished dream of foodies among the events of Dubai Food Festival 2016. “Dine with the Stars” is a most-awaited evening of incredible food in company of celebrity chefs. Guest chefs will share their personal stories over food at five-star restaurants in Dubai. Chef Manal Al Alem, a Middle Eastern cooking expert from “Queen of the Arabian Kitchen”, will grace the event. Among other eminent guests in attendance are international celebrity chefs George Calombaris, Gary Mehigan, Matt Moran and Shannon Bennett from Australia. Dubai Food Festival 2016 should not be a miss when iEagle Travel is booking cheap international flights to Dubai. The best flight is guaranteed for the lowest fare.